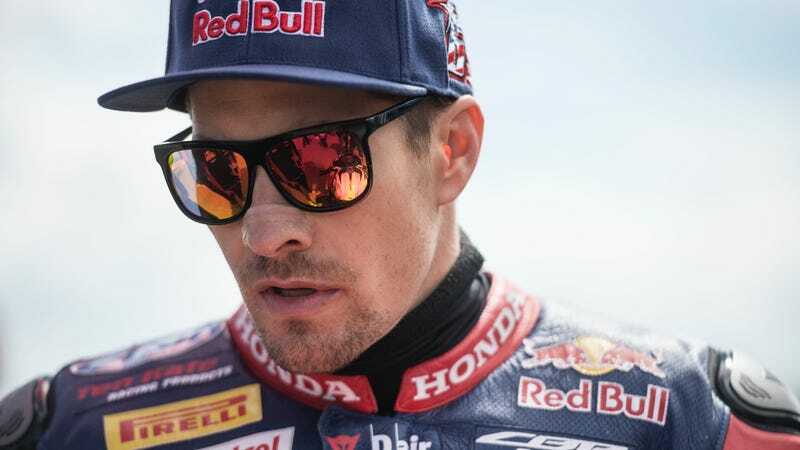 American motorcycle racer Nicky Hayden succumbed Monday to injuries from being struck by a car while cycling Wednesday in Italy ahead of the World Superbike race at Misano, multiple outlets are reporting. Hayden was the last American motorcycle racer to win a MotoGP world championship in 2006. He was 35. “The Kentucky Kid” started riding when he was only three years old, supported by parents who were into flat track racing and who even built a mini-flat track for their kids to ride on at their family home in Owensboro. Hayden soon moved into CMRA club racing, and even adopted his father Earl’s racing number, 69. “I crashed a lot, so I needed a number that you could read when I was upside-down,” Earl joked on Hayden’s website. Hayden’s win of the 1999 AMA 600 Supersport title helped him land at a Honda factory team for 2000. After narrowly missing out on the AMA Superbike title in 2001, he became AMA Superbike’s youngest ever champion in 2002. That was the big break Hayden needed to catapult into MotoGP with the Repsol Honda factory team. His first win was at his home American round at Laguna Seca in 2005. In 2006, Hayden won a season-long battle with MotoGP legend Valentino Rossi to win the MotoGP championship. Hayden moved to World Superbike in 2016, where he has been riding with the Red Bull Honda World Superbike team.